September! Oh man, can you believe it’s already September? First off, I took an unplanned break from blogging. It felt good to unplug for the summer. I removed Facebook from my phone and tried to only post on Instagram when baby was asleep. I made an effort to be mindful and stay present. We had so much going on (our house sold in a week, then we had to find a new house, moved to the new house and did some minor construction to make it livable and safe for baby). I took plenty of pictures to document it all, so hopefully I will be able to share them in the future. 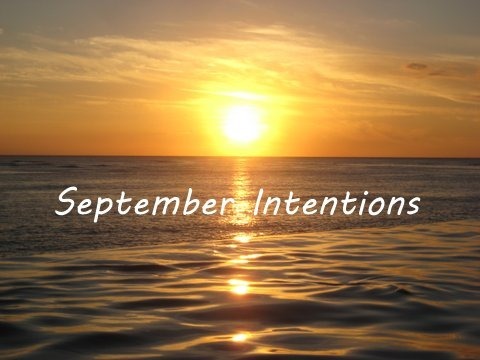 But this post is about my intentions for the month of September. As we welcome September I’m looking at this month as a new season. In my mind, there is this clean slate feeling to September that I love and I’m ready to jump right in. finish baby’s nursery – since we moved when Hawke was 4 months, this is the 2nd nursery that I will be decorating. read a book – I haven’t read a non-pregnancy/baby related book since last October, almost a year ago. Mostly just focus on my work and my health and mental well-being. I should be more specific though! Good for you! Nice to see you back though! September goals – meditate regularly; fine tune my working mom schedule. Any tips?